1. The clang of metal poles and the sounds of hammering are practically constant as Jerusalem's apartment dwellers hurry to erect their sukkot and squeeze them into small balconies, odd-shaped gardens and otherwise derelict rooftops. 2. The tourists have landed! Overwhelmingly religious English and French speaking, they jam the city's take-out places and restaurants, and may be seen in packs wandering up and down Emek Refaim and the new Mamilla mall talking to their friends at top volume on their cell phones. 3. Almost every non-profit group worth their salt has scheduled a fund-raising and/or familiarization event for the days of Chol Hamoed Sukkot, aimed at capturing the attention of the wealthy temporary Jerusalem residents. 4. Real estate agents are taking a deep breath before their busiest week of the year as they prepare to pitch their over-priced wares to eager foreign buyers. Each of the many luxury residential building projects around town managed to put up billboards depicting the completed construction and inviting prospective buyers in for a tour of an unfinished building site. 5. You can't get on a bus without being poked in the rear a dozen times with someone's stray lulav. 6. The sweet smell of etrogim in Jerusalem's Machane Yehuda (Yehuda Market) is overpowering. Huge crowds descend on a lot on Jaffa Road neae the market to vie for the best lulav and etrog. 7. One enterprising bookstore is offering "Machzor rentals" for tourists who inadvertently left their holiday prayerbooks at home. 8. You've never seen such gaudy sukkah decorations in your life---unless you've been to Wal Mart on Xmas eve. Kiosks manned by bearded Haredim in Meah Shearim are selling gold, green and red tinsel hangings---exact replicas of Xmas decorations in the Old Country. 9. Huge piles of schach (palm fronds for the roof of the sukkah) cover major city squares, and citizens are invited to take as much as they need for free. 10. 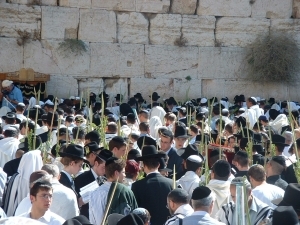 The usual throngs of traditional Jews are expected at the Western Wall for the thrice-yearly observance of the ancient ritual of Birkat Cohanim--Blessing by the Priests--that takes place during the intermediate days of Sukkot. This year,on the same day as Birkat Cohanim (Thursday) we have the added ceremony of Hakel--the national gathering that takes place on the Sukkot following a Shmitta or sabbatical year. 11. Like Xmas tree lots back in the US, empty city lots all over Jerusalem are taken over to sell sukkot of every size and description. Some are marketed by large companies and feature the latest space-saving technology and hardiest material, while others are simpler affairs made of tubular piping and plastic walls.. Every kosher restaurant in town has a sukka of some kind and each boasts bigger and better holiday specials to entice customers. 12. Since the entire week of Sukkot is a national holiday you'll have a tough time deciding which festival/event to take part in. There's the New Age Bereishit Festival at Dugit beach; The Tamar music and arts fest at Ein Gedi; Rishon L'Tzion's Song Festival and a Storytellers Festival in Givatayim, to name just a few. One annual event that won't be taking place this year is Acco's acclaimed Fringe Theater Festival--too much real live drama between Jews and Arabs going on at the moment. The festival has been indefinitely postponed. 13. Touring the country is another favorite Sukkot activity and every political group is promoting trips to "See For Yourself." Hevron is a perennial favorite for Chol Hamoed (intermediate festival days) with a special opening of the Isaac Hall in the Cave of the Patriarchs that's normally off-limits to Jewish visitors. The far left organization Ir Amim funded by the European Union and the Ford Foundation, offers to take visitors to see their version of Jerusalem. 14. Not to be left out are those Christian friends of Israel--the International Christian Embassy of Jerusalem will bring 6,000 members from 80 nations to attend their annual Feast of Tabernacles celebration. The Christian contingent dressed in costume of their countries of origin will also take part in another annual Sukkot event, the Jerusalem March, where tens of thousands proudly march through several routes of the capital. Organizers claim that the Christian event will pump $10 million into the local economy, taking up 15,000 hotel room nights during their stay. Not everyone is happy about the Feast, however. Last year, Israel's Chief Rabbinate's Committee for the Prevention of the Spread of Missionary Work in the Holy Land issued a ruling forbidding Jews from participating in the Jerusalem march organized by the International Christian Embassy for Jerusalem. 15. Another prominent group of tourists set to arrive are refugees from the young frum singles scene who make an annual migration to Jerusalem from the Upper West Side for Sukkot. Discreet meetings of earnest, well-scrubbed, modestly dressed twenty-somethings take place in all the major hotel lobbies. 16. And speaking of refugees--spare a thought for those 1,700 families expelled from their homes in Gush Katif in August 2005. More than three years on and hardly any of them are living in permanent housing. More than 1,000 former Gush Katif residents are still unemployed. Several have died at a young ages and many couples have divorced due to the economic and social pressure and the uncertain future they face. Neither they nor the Israelis in and around Sderot who live under the threat of Hamas shelling will need to be reminded of one of the essential messages of the Sukkot holiday--the flimsiness of our physical existence and our reliance on God for sustenance and shelter.